You know that old saying about not judging a book by its cover? A new study proves you can’t judge the meat in pet food based on the cover either, er, label. Just because it says “beef” or “chicken” doesn’t mean it is. This is getting bad. In a study published in the journal, “Food Control,” researchers from Chapman University's Food Science Program set out to test the meat sources in 52 popular commercial pet foods. They used sophisticated DNA analysis to determine if the protein source was what the manufacturer claimed it was. It wasn’t in 20 of the 52 foods tested. That means about 40% of the foods contained a meat source other than what you thought you bought. This is really bad. First the good news: They didn’t find any horsemeat. The fact that the researchers were testing for horsemeat should tell you something about the current state of pet food. Thank goodness for small favors I guess. 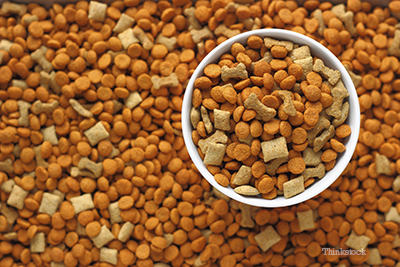 Now for more bad news: 13 of the mislabeled foods were dog chows and 7 were for cats. At least the pet food companies are ripping off both species. What really startled me was that one pet food, “contained a non-specific meat ingredient that could not be verified.” All we know is that it wasn’t beef, goat, lamb, chicken, goose, turkey, pork or horse. Goose? Chicken was the most common meat found in all pet foods, found in 51 of the 52 foods. 16 of the tested foods contained a meat that wasn’t listed anywhere on the ingredients. Pork was the most commonly substituted protein, appearing magically and without warning. What does this study mean for my pet food? Warning is the right word to use for this issue. If your pet suffers from a food allergy, an unanticipated meat source can send him into distress or worse. It also brings into question studies that used pet food ingredient lists as the basis for determining food allergies and elimination trials. Oh yeah, that’s all of them. This is really getting worse. Until we know more, the best advice I can give you is to contact your pet food manufacturer and ask them how can you be certain what they say is in their food is really in their food? For years, many of us have quietly raised our concerns on this very issue and were summarily dismissed as quacks. Now, perhaps our concerns will lead to more research? What this really speaks to is trust in the system. We need to have our confidence in the pet food industry restored on many levels. Whether it’s toxic additives slipped in along the multinational food processing chain, bacterial contamination, or secretly substituted meat sources, my faith in the system is shaken. It’s not too late to fix it. Good companies with an interest in transparency, safety and doing the right thing will step up. I’d like to see them pledge to disclose the source of all ingredients, origin of processing, DNA traces on protein sources and easier to read ingredient and nutritional value lists. Until then, don’t judge that bag by its label.